Encouraging Austin family experiences with hiking, live music and art. I went to music festivals when I lived in Houston in the early 90s and this is what I remember. Lots of heavy drinking that led to fights that sometimes involved the police. One time I saw a fight with two women pulling out each others’ hair as they tumbled down a hill. I never thought that I would bring my kids one day. But now it was twenty years later and I was a Mom and I wanted to give it a try. I brought Sparkles, who is 5-years-old, to the Austin City Limits Music Festival (ACL) last Saturday. ACL is a long way from the festivals I went to when I was younger. Zilker Park is clean, the crowd is well-behaved and I haven’t seen any arrests in the several years that I’ve gone. And the festival welcomes kids. For one thing, kids ten and under get in free. For another, Austin Kiddie Limits is a section of the park just for kids, with temporary tattoos, pottery painting, a DJ workshop, video karaoke and more. There is a stage in Austin Kiddie Limits with kid-friendly bands. What’s not to love? Sparkles thought ACL was cool, because I told her you have to be five-years-old to go (my own personal rule) and that meant Buttercup had to stay home. Sparkles liked the activities and also the food (Austin Pizza‘s cheese pizza) and the treats (Coolhaus‘ ice cream sandwich). 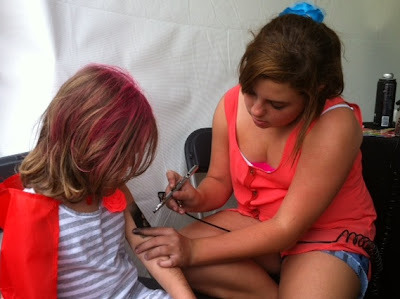 She waited a long time for H-E-Buddy‘s Alter Ego Factory, because one small part of it was face painting and she loves face painting. I picked her up and she leaned her head on my shoulder. I got my phone out of my bag and started to record my next interview. Sparkles must have felt a little better, not having to walk anymore, because she softened her stance. [Carol] Sparkles, how did you like ACL this year? [Sparkles] (In a soft, tired voice.) Good. [Carol] What was your favorite part? [Sparkles] Um, my hair getting dyed. [Carol] What color is your hair right now? [Carol] What was your least favorite part? [Sparkles] My face getting a butterfly. [Carol] (Confusion.) Did you like that part or not like it? [Carol] What was your favorite thing you ate? [Carol] What would you tell other kids who were thinking about going to ACL so they could have fun? [Carol] Would you come back next year? As I carried her across the pedestrian bridge at Mopac, I decided that our day felt like the weather, partly cloudy with a chance of rain, not the perfect day, but not too bad either. I wondered if I would like to come back next year with one or both of my girls. The type of things Sparkles enjoyed most could be found at a community festival or Nutty Brown Cafe‘s summer kids’ nights. Those events are much easier to get to and from and they don’t require an adult-priced ACL ticket for Mom and/or Dad. In the end, I’m neutral. I might do it again and I might not. For other kids and parents, I think it depends on you and your kid and what y’all like and don’t like. It can be fun, but there are simpler, easier ways to have fun too. The surprise ending to this day is that Blue Eyes offered to take Sparkles home and let me stay at the festival. Thanks, Blue Eyes! I connected with some friends, I escaped from the hardest rain under a tent and I got to see Jack White after all. The stage was bathed in blue light. Jack White felt like equal parts of brilliance and crazy. He was backed by five strong, wicked-talented, female musicians. His show was why I love live music, when you feel it in your bones and you stop thinking about anything else. That ending wouldn’t have happened at a community festival. Hmm, maybe I’ll split the day on purpose next year. We’ll have to wait and see. I saw evidence that proves beyond any shadow of a doubt that Austin, Texas, is, indeed, the Live Music Capital of the World. There was live music at my grocery store, H-E-B. 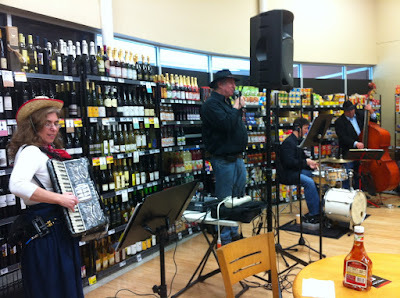 The Yiddish Cowboys were playing at the Kosher Store in the H-E-B on Far West. I’ve seen live music at city council meetings, at the airport, during a movie and at my neighbor’s parties. What is next? Live music in elevators? Live music in my car? Could it go too far? No, not really. I like to stop and listen and leave a tip. It is fun and makes the day more interesting. Now, if live music shows up in the bathroom, maybe then it would be strange. then about 24 more things that start with the letter A…..
Blue Eyes was suspicious that we needed four kinds of apples and two kinds of Angle Food Cake. He was also suspicious because the list had several hundred items. I forgot to add the filter for Needed Items on my Splash Shopper iPhone app, so I sent him a list of every item we have ever purchased at H-E-B in the last two years. Oh, my, we must be hungry at my house.